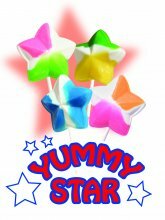 Star Pops 640 pops in each case - $160.00 : FiveStarFundRaising!, Five Star Fundraising, Fundraising and fundaisers for all youth groups, elementary schools, and all non profit groups. Please Select Boston's Best C.. Cima Confection.. Delisheries Coo.. Jacks Links Maredy Savory Cookie D.. Scentco Van Wyk Confect.. Copyright © 2019 Five Star Fundraising.